Stocks moved higher on Monday and all four indices gained ground as a result. The Nasdaq led the way with a gain of 1.15% and it was followed by the Russell with a gain of 0.71%. The Dow and S&P turned in gains of 0.70% and 0.68%, respectively. Eight of the 10 main sectors moved higher. The tech sector led the way with a gain of 1.62%. The industrial sector was the second best performer with a gain of 1.34% and it was the only other sector to gain more than one percent. The healthcare sector was the worst performer with loss of 0.30% and the materials sector was the only other sector that lost ground, suffering a decline of 0.17%. My scans produced another negative result last night with 33 names on the bearish list and four names on the bullish side. For those keeping track, that is the 18th straight night with a negative result. The barometer changed very little when the results were added in, climbing to -30.1 from -30.4. 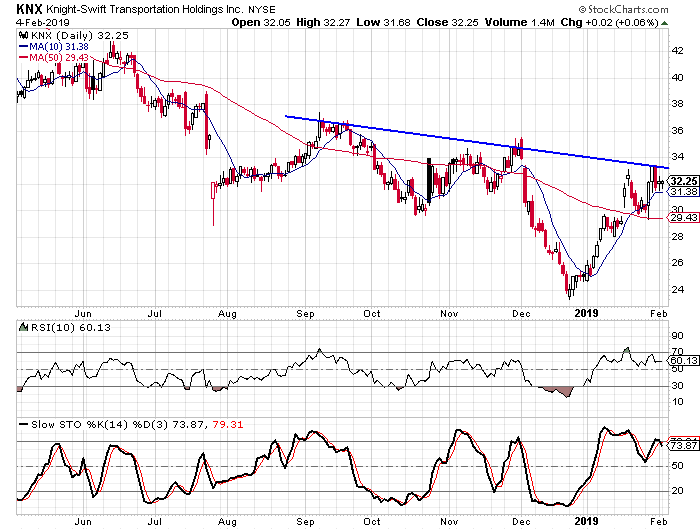 Today’s trade idea is a bearish one and the subject of the trade is Knight Swift Transportation (NYSE: KNX). The company’s fundamental ratings aren’t that bad, but the chart suggests another leg down is due. The company scores a 77 on the EPS rating system and a B on the SMR ratings. The daily chart shows how the stock gapped lower back in July and since that time the highs connect in a slight downward slope. It just hit the trendline in the last few days. The stock has been in overbought territory for quite a bit of time in the last month and the stochastic readings just dipped below the 80 level and made a bearish crossover. Buy to open the March $35-strike puts on KNX at $3.80 or better. These options expire on March 15. The options will double if the stock drops to $27.40. The stock dropped below $24 in December, so it won’t have to break to a new low. I suggest a target gain of 100% with a stop at $33.50.